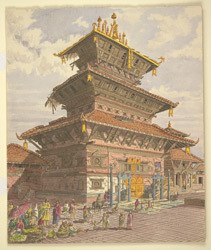 Watercolour of the Bhairava Temple at Bhaktapur in Nepal, by Henry Ambrose Oldfield (1822-1871), dated April 1852. The image is inscribed on the reverse: 'Temple of Bheirab, Bhatgaon, built AD: 1717, sketched April 1852'. Dr Oldfield, who was Residency Surgeon at Kathmandu from 1850-1863, wrote in 'Sketches from Nipal, Historical and Descriptive...' (1880), "Bhairab and his consort Bhairavi are very popular forms of Mahadeo and Parvati, and are worshipped by Buddhists as well as by Hindus...The Bhairabjatra or Biskati, as it is called by the Niwars, is a festival in honour of Bhairab and Bhairavi. It is one of the three grand Niwar festivals, one of which takes place annually in each of the three principal cities of the Valley. It occurs in Bhatgaon as the Machendrajatra does in Patan, and the Indrajatra does in Kathmandu. Bhairab or Bhairava is an incarnation of Shiva as the "Destroyer", and is a most popular deity in Nipal, where he is looked on as a guardian-angel of the country...He has a great many temples dedicated to him, and in all directions are seen stone alto-reliefs of him of various sizes, and generally, if not always, representing him as trampling upon one or two demons...The festival at Bhatgaon commences on the first day of Baisakh, and lasts for two days...The first part consists in a procession of two cars, in one of which a figure of Bhairab is seated, and in the other a figure of Bhairavi. They are dragged in triuph through the city; and this constitutes the Ruthjatra. The other jatra consists in the erection of a long beam of timber called the Linga in front of the temple of Bhairab near the Darbar, and round it Puja is made, buffaloes slain, &c. This is the Lingajatra."